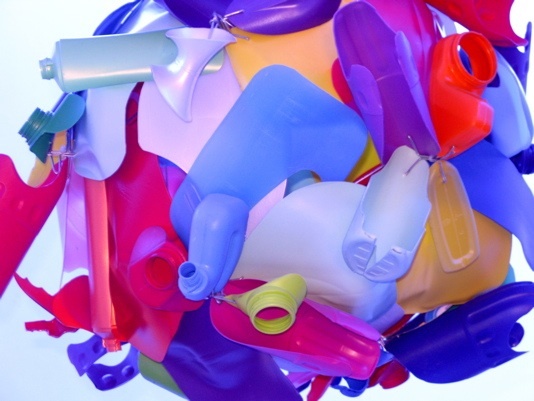 South African designer Heath Nash unveiled a colorful, eclectic chandelier made almost entirely from recycled PET bottles at this year’s Milan Design Week. Dubbed Bottleformball, the brilliantly-hued recycled creation is crafted from multicolored pieces of salvaged bottles attached to a hand-made wire structure. We love how the artfully arranged bottle pieces look almost like colored ceramics when illuminated from within. Nash’s Bottleformball was showcased at the Misael Gallery, which sought to “Redream Paradise” by showcasing an eclectic group of artists and designers all working with recycled materials to create modern ecological designs. Misael artists redream paradise by reusing industrial materials to recreate natural or organic objects. Misael went to South Africa to team up with thirty-six year old Heath Nash, who has been working with recycled materials since he was a young boy — a tradition that you will see on every street corner if you visit South Africa. 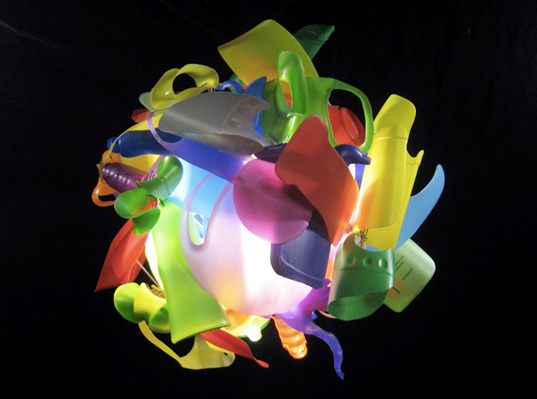 For the last 15 years, he has developed his art to transform plastic bottles into works that could light up any room. For this correspondent, the objects and the vitality of the colors recall the still brightly shining works of the 13th century artisans of the Della Robbia clan, who worked with glazed terracotta. The Misael Gallery currently has spaces set up in Milan and Cape Town, and will soon be opening a space in Vincenza, Italy, before branching out to Shanghai where they can expand their concept of eco design across three continents. I really want to make something like this. I love Dale Chihuly glass sculptures/chandeliers, and this is very evocative of them. Does anyone have any idea how it's all attached? Unbelievable!!!!! Where an I see more and where are you situated? South African designer Heath Nash unveiled a colorful, eclectic chandelier made almost entirely from recycled PET bottles at this year's Milan Design Week. Dubbed Bottleformball, the brilliantly-hued recycled creation is crafted from multicolored pieces of salvaged bottles attached to a hand-made wire structure. We love how the artfully arranged bottle pieces look almost like colored ceramics when illuminated from within.